Elon Musk has just revealed that nearly 400,000 people have put down the $1,000 deposit required to be in line for Tesla’s Model 3 – its $35,000 assault on the mainstream motoring industry. That that sort of demand “surprised even us”, Elon Musk told a conference crowd in Oslo this morning, according to Reuters. While that comment sounds like a bit of modesty, Musk does have cause for concern. Despite the company’s $25 billion valuation – which makes it more valuable than Mitsubishi, Kia and Mazda – it has only made and sold 125,000 cars worldwide since it first began delivery of the Tesla Roadster in 2008. As a direct comparison, to break into the top 10 of world’s largest car-makers, you have to be producing close to three million cars, per year. At its current rate of 15,000 cars per quarter, to satisfy just the amount of pre-orders it has received thus far, it would take six and a half years to get those cars made and shipped. Also, as Tesla has already admitted, to satisfy that demand it would need to buy up the entire globe’s production of lithium ion batteries. So with that production rate and the availability of lithium ion, if you’re hoping to get your new Model 3 when the car supposedly goes on sale next year, you may have to buy something else to tide you over. Now, maybe that’s being a bit mean to Tesla. It has of course, created an interest in electric cars that has transcended traditional motoring circles. And it is building its $5 billion Gigafactory that when it becomes fully operational in, ahem, 2020, it’ll be able to produce 500,000 lithium ion batteries a year. It has also, in its pre-order strategy for the Model 3, cunningly created a crowd-funded car. Making an automobile from scratch is hella expensive. To make a bog-standard petrol powered car from existing parts will set you back a billion dollars, according to John Wolkonowicz, a senior auto analyst at IHS Global, a market analysis company. If you want to build a whole new car, with new transmission, engine and a chassis for it to sit on, costs can go all the way up to $6 billion. Tesla is in the new platform business, so much so it loses $4,000 on every car it sells. Last year in a single quarter it burned through $359 million, and analysts are all pointing to that number continuing to rise in the next year. With its pre-order scheme it has brought in nearly $400 million in less than a month. That’s smart. But again, there is an issue over whether people are going to be willing to hang around that long to get a new car. The current prediction for delivery is late 2017 for West Coast US before moving east. But that doesn’t factor in Tesla’s notoriety for completely missing the delivery dates the company sets out ahead of launch. When the Model X was vehicle was first discussed, it was expected that early shipments would commence in 2013. However, by March 2013 nothing had arrived and Tesla pushed back the shipping date to late in 2014. Later on that year, it would push it back again to Q2 in 2015. But even for super fans like Tesla investor Steve Jurvetson and Google founder Sergey Brin – they didn’t get their cars until the end of September. Deliveries for the rest of us mere-mortals is only just beginning. 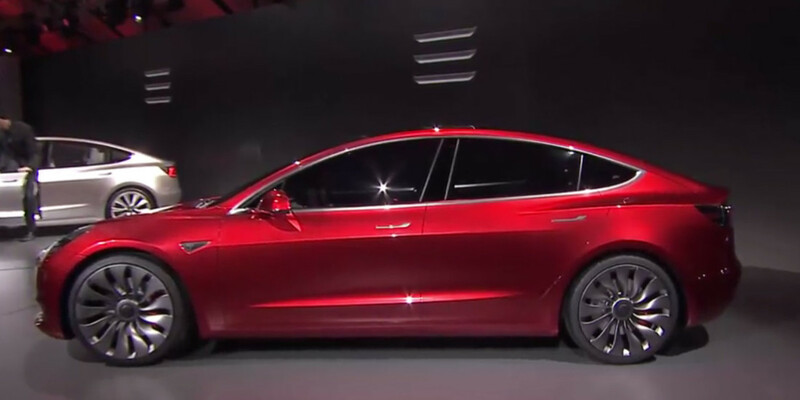 The Model 3 is meant to be Tesla’s assault on the mass-market, where the likes of GM, Ford, Toyota and European giants have honed their manufacturing and distribution networks to be able to build a car to spec and deliver it within a week. Last year, Nissan’s Leaf was the biggest selling electric car worldwide. It’s a small, podgy looking thing that will only do 100 miles on a charge. This year, General Motors will start rolling out its Chevy Bolt, an electric car that can do 200 miles on a charge, costs $30,000 and looks a lot more appealing visually than the Leaf. Others are not far behind. Personally I’d love to see Tesla succeed. It’s combination of over-the-air updates and tech-centric approach to cars makes me excited about the prospect of driving. Something I haven’t felt since I was 17. But the hype surrounding the Model 3 and the history of broken promises suggest the future might not be as rosy as some believe it will be. I hope its worth the wait. Read next: How do you feel about ads on Quora?